FILE - Association of Southeast Asian Nations (ASEAN) foreign ministers and Secretary-General Le Luong Minh pose for a group photo during the ASEAN Foreign Ministers Meeting (AMM) in metropolitan Manila, Philippines, April 28, 2017. 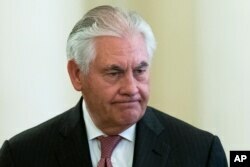 A meeting of foreign ministers from the 10 member Association of South East Asian Nations (ASEAN) with the U.S. Secretary of State Rex Tillerson this week comes amid ongoing tensions on the Korean peninsular as well as concerns over China’s growing influence in Southeast Asia. The meeting is officially geared towards planning regional summits in November, which U.S. President Trump is committed to attend. U.S. officials said the ASEAN foreign ministers had been calling for the meeting as part of regional efforts to engage with the new administration. Secretary of State Tillerson earlier said the ministers were expected to discuss trade, territorial claims in the South China Sea, trafficking, crime and other issues. FILE - US Secretary of State Rex Tillerson arrives to meet Russian Foreign Minister Sergey Lavrov prior to their talks in Moscow, Russia, April 12, 2017. 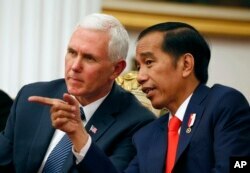 The meeting in Washington follows U.S. Vice President Mike Pence’s recent visit to the Asia Pacific, including Indonesia. During the visit, Pence said Washington was “taking steps to strengthen our partnership with ASEAN and deepen our friendship,” aiming to strengthen economic ties and security cooperation in combating terrorism and the disputes over the South China Sea. FILE - U.S. Vice President Mike Pence (left) talks with Indonesian President Joko Widodo during their meeting at Merdeka Palace in Jakarta, Indonesia, April 20, 2017. Pence is on a 10-day trip in Asia. Analysts told VOA ASEAN states have been urging talks with the U.S. since the administration took power in January. Media commentaries said the administration’s “America First” rhetoric and the U.S. withdrawal from President Barack Obama administration’s Trans Pacific Partnership (TPP) had unnerved ASEAN leaders. 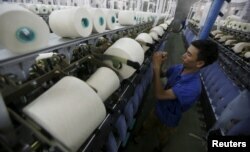 The ASEAN region has built its economic prosperity on trade with the U.S., currently valued at $225 billion a year. But moves towards growing trade protectionism, raised by United Nations economists this week, has led to fears of a wider impact on the region’s growth. FILE - A man works at a yarn weaving plant in Ha Nam province, outside Hanoi, Vietnam, Oct. 7, 2015. The demise of the TPP has opened further opportunities for China, now the region’s main trading partner, to expand its influence through Regional Comprehensive Economic Partnership (RCEP). The grouping, besides ASEAN states, includes Australia, India, Japan, South Korea and New Zealand. Thitinan Pongsudhirak, director of Chulalongkorn University’s Institute of Security and International Studies (ISIS), said by rebuilding ties with Southeast Asia, the U.S. is acknowledging it has lost ground to China. “It’s a clear indication that the Trump administration wants to revive these bilateral alliances and to work with partners like Singapore and others in the region in order to elevate its position in the region, in order to regain some ground vis-a-vis China,” Thitinan told VOA. President Trump earlier this week called on the Prime Minister of Singapore, Lee Hsein Long, Philippines’ President Rodrigo Duterte, and Thai Prime Minister, Prayut Chan-o-cha with a personal invitation to the White House. FILE - Philippines President Rodrigo Duterte gestures while addressing the media following the conclusion of the 30th ASEAN Leaders' Summit in Manila, Philippines, April 29, 2017. Analysts say the calls followed an ASEAN leader’s summit statement that downplayed the issue of China taking a larger security presence in the South China Sea through the construction of infrastructure on disputed islands. Thitinan said the ASEAN final statement marked a diplomatic victory for China. “The U.S. is nowhere to be seen, so Tillerson and now Donald Trump — the U.S. government is picking up its game a little bit and for ASEAN this is something that they have been looking for,” he said. Analysts say the Washington meeting is also seen as offering a key opportunity to discuss ASEAN’s concerns over the tensions on the Korean Peninsula. 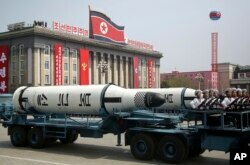 FILE - A submarine-launched ballistic missile is displayed in Kim Il Sung Square during a military parade, April 15, 2017, in Pyongyang, North Korea to celebrate the 105th birth anniversary of Kim Il Sung, the country's late founder. 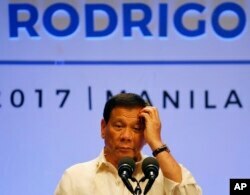 The Philippines' Duterte, at the end of the leaders’ meeting, called on the U.S. to show restraint in its diplomatic standoff with North Korea over Pyongyang’s nuclear weapons and missiles program. Phil Robertson, deputy Asia director for the U.S.-based Human Rights Watch, said the U.S. president’s calls to Thailand, the Philippines and Singapore marked a return to U.S. regional security policy seen during the Cold War era. “What is quite clear is this, when you reach out to Singapore, the Philippines and Thailand, all at the same time on the same day, you are basically calling the old stalwarts — the key parts of the U.S. security presence in the Asia — Pacific region,” Robertson told VOA. James Chin, director of the Asia Institute at the University of Tasmania, said other elements in the ASEAN foreign ministers meeting are hopes by the U.S. to boost regional backing in any security strategy to deal with North Korea. “It’s all got to do with North Korea and China. At the present moment it’s got more to do with North Korea. It’s all about building a coalition. I suspect that they are in the process of confronting North Korea, regardless of what China is doing, so they [are trying] to put together some sort of coalition,” Chin said. Analysts say ASEAN, which is divided in support between China and the U.S., is expected to be unified given the U.S. and China are cooperating to ease tensions on the Korean Peninsula.